Go Ahead! Shoppe Til You Droppe! We Accept Visa, Mastercard, Discover, American Express, Diners Club, Library Card, Playing Card, Greeting Card, Chickens, Cows, Pigs, Pints Of Blood, Sweat Equity.. AND We Have Over Two Dozen ATMs In Our Gifte $hoppe Restrooms! Talk to our incoherent and mentally unstable staff about setting up one or two of our EZ Paymente Plannes! NO FOSSILS HERE - FRESH FROM THE C4CS PADDOCKS! By now you've probably lost a family member or two, so why not shell out a few bucks for some trivial piece of crap or a useless dust collector? You know, something to help you remember your day here. Be sure to stop at the Official C4CS Gifte $hoppe to remember a loved one with a highly overpriced, lead-infested, plastic dinosaur or something. Our dubious staff of professional pick-pockets will be more than happy to nag you into purchasing a rock which we pass off as a real dinosaur bone. It makes a great conversation piece, or more likely, a paperweight or just makes the garbage that much heavier when you throw it out a couple days later. We carefully choose the items for our Gifte $hoppe to be fun and educational. Or to serve as a memorial, which is the reason most of the time. Gifts are available in all price ranges, starting at the HR level (highway robbery) and up. And up.. aaaand up. 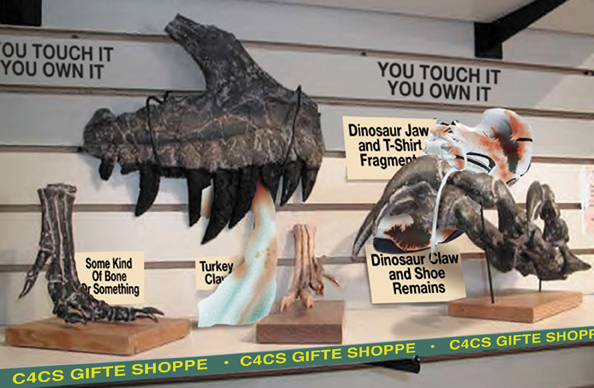 We have all the C4CS Dinosaurs in scale model sizes, plus a selection of museum-quality bones. Not fossils... bones. Mostly from some of our DinoResidents who have been in fights - and obviously lost. Sorry, we have no replicas, casts of, or real 'fossils' here. Only bones. Our toys for the kids include DinoPuzzles, Dinosaur skeletons that glow in the dark (and are thought to be chemically safe), exploratory "dig" kits, and many other things your kiddies can have fun with while gluing their fingers together or swallowing pieces and turning purple- just like Barney! Talk to our Gifte $hoppe Loane Departmente to get you all set up on our EZ Paymente Planne. They're available anytime you are serious about buying anything. We've just lowered our loan rates from 'Incredulous' down to a much more friendly and affordable 'Atrocious' so now's the time to take advantage of huge savings! Hardbound, Hollow, Shipping Not Included. In Fact, Printed Pages Not Included Either. Here it is! Now in it's 4th edition. Yes, that's right. We've printed four of them! 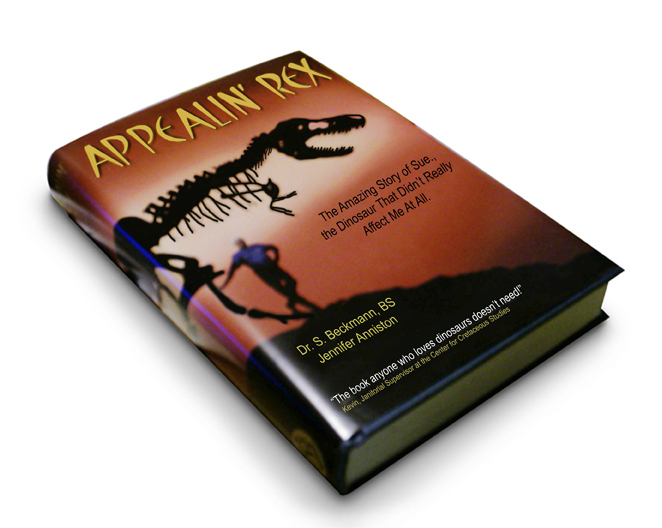 Described as "the perfect book" by almost one person, Appealin' Rex has been printed in both American, English and Canadian. With more than six photographs, three in focus, and two of those being Jennifer Aniston, plus crayon drawings ripped from the refrigerators of C4CS employees kitchens, and finger-paintings stolen from children's Dinosaur drawing books, this highly illustrated work will take you right into the heart and soul of someone else's career in dinosaur digging- certainly not Dr. Beckmann's. "Edge of your seat" doesn't begin to describe the action in this thriller. In fact, you are NEVER close to the edge of your seat throughout this book. It has been described as "the world's greatest sleeping pill" by those awake long enough to get past page one. When it first came out most book reviews ended with "zzzzzzzzzzz"
Get one copy, or a dozen. It makes a great gift for your church's annual book-burning event! T-SHIRTS FOR THE ENTIRE REMAINING FAMILY AND MORE! 50% Cotton, 50% Dacron, 25% Blood-Soaked, 320% Marked Up! After popular demand, we brought them back anyway! These fine examples are made from itchy, cheap, fabric, hand-crafted by forced child labor in southeast Asia. They will surely be the focal point of your next Social Awareness Meeting. C4CS T-shirts are woven to burn instantly when placed within five feet of any flame. In fact, they start to smoke if left in the rear window of a closed car in Summer. This makes them the highlight of any protest involving the burning of effigies or icons at local, state, or national events. Burning with a bluish flame from the numerous lethal gasses released by the heat, you'll stay toasty warm during those long wintry protests wearing a short-sleeve t-shirt. By the way, did we mention that we strongly recommend storing these shirts in the refrigerator, preferably in water?? Cretaceousland! "Survivor" T-shirts (not shown) are widly popular and extremely rare. We couldn't even find one to photograph for this ad. However, you can proudly display the results of your visit to Cretaceousland!, should you survive and at the same time explain what happened to your family to those attending the mass funeral. These shirts are guaranteed to be a major part of your future mental counseling, be it individual or group sessions. Bright green lettering with the Cretaceousland! logo emblazoned on the front, with plenty of soft, white cloth on the back to soak up tears.... or blood. Choose from a wide assortment of shirts which pertain to any former member of your immediate or distant family tree. Well, former family, that is. We even have shirts available for Second Cousins, or Brother's Sister-In-Law's Uncle! If it's a family member, we have it! T-shirts for both C4CS and Cretaceousland! are available in a wide variety of colors. Choose from our vast assortment listed below. Available in Small, REALLY Small, HO-scale, and XM sizes only. 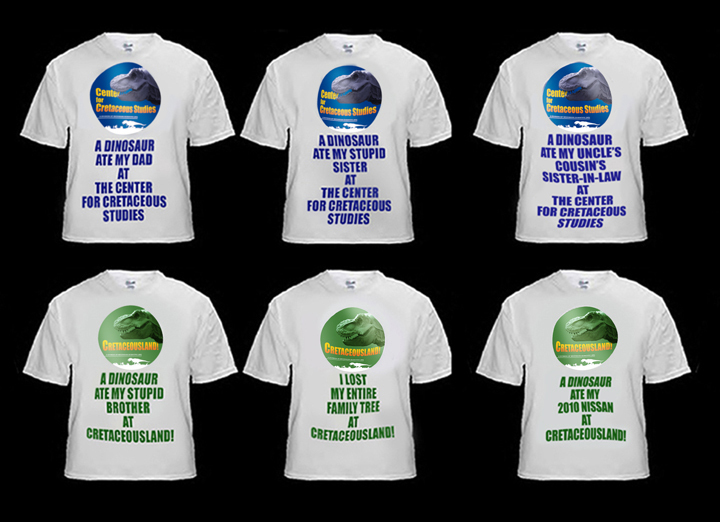 We figure anyone L to XXXL will probably be the ones who are named on the Center for Cretaceous Studies or Cretaceousland! t-shirt. Please specify when ordering. Allow 3-4 years for delivery. C4CS and Cretaceousland! Baseball Caps are used, but in a "good" way. These cranium toppers will keep your noggin out of the sun, even though they seem to have this tendancy to melt in temperatures exceeding 82ºF. They'll also keep your hair dry during precipitational weather conditions, even if they sort of dissolve when wet. Manufactured by Pygmy laborers in remote Polynesia, these hats are made from 30% dacron, 80% polyester, 25% cotton-like substance, 40% recycled material (i.e. tires), and 0.9% financing! For some reason not available in states with a lot of vowels in them. ACTION-PACKED! THRILLS! SPILLS! CHILLS! WILLS! Sit in horror every Family Movie Night with a bucket o' popcorn in the comfort of your own living room filled with remaining family and friends, and watch this half-length gore fest. 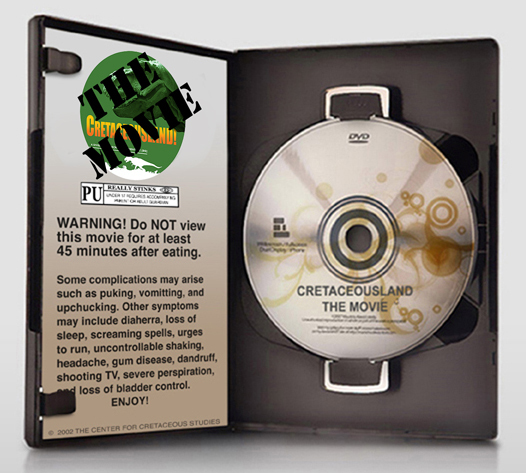 Cretaceousland!, The Movie, takes you behind the scenes at what happens on a normal day here at the world's only live Dinosaur Reserve and Research Center. This is C4CS live. Real. No CGI. No puppets. No make-believe crap. And it happens every freakin' day! The 90-minute movie includes almost 30 seconds of "quiet time" (no roaring, bellowing, biting, chasing, blood-flowing, etc.) because we had to put the government warning in some place. Tapes and DVDs include deleted scenes which we've categorized as "out-takes". We recommend not eating 45 minutes before viewing this part. The VHS tape is designed to wrap itself around your VCR's heads during the second or third viewing. Be sure to get more than one when ordering! DVD's have been found to skip around so bad that the DVD Player will actually eject the disc automatically. And by "eject the disc" we mean it will toss it like a Frisbee across your viewing room. *Special* autographed tapes and DVDs are available by request for a nominal surcharge. We have NO idea who will autograph them, but we can probably get Hank, down in Shipping & Receiving, to do it. Whatever. We'll find someone to scribble an important looking name on your copy. Pick up any of these highly overpriced trinkets at the Gifte $hoppe today! • Keepsake, plastic dinosaurs (choose from dozens of Raptor species) available in assorted (fake) colors and scales of size. Now with 3% less lead. Yes, with two forms of ID, proof of insurance, and a good credit card or personal co-signed check, you can be the hit of your block party, or your city, county, and most likely, the entire freakin' state... when you Rent-A-Dino from The Center! Our Dinosaurs have been a very, very popular attention-getters at numerous company functions, gatherings, and stockholder meetings over the years. Or so we've heard from the few survivors. Is your company downsizing? Can you THINK of an easier way to get it done? You'll find that our Dinosaurs always tend to get your clients, employees, or guests "involved" with your presentation. And we mean immediate respect and full attention to every word you say. They will, for the rest of their abbreviated lifespan, always remember running frantically with hands waving overhead and screaming... ah, those fun-filled final moments! One thing for sure, our Dinosaurs always seem to be great for getting people up out of their chairs and moving, even to your long-winded, boring, monotone delivery. Are your corporate meetings filled with "dead air time"? Are your clients or employees sitting mummified over their cold Chicken Cordon Bleu or last week's Roast Beef while some schmuck drones on and on about company hum-drum? Well, Buck-o, nothing wakes up a dozing, semi-comatose crowd like 5-tons of eardrum-splitting, roaring, Tyrannosaur!! Seriously, our Appalachiasaur has been measured at 145dB on several occasions, and our Spinosaur hit 158dB in the hallway during a recent DinoAlert. "One of the best motivational tools ever brought to our conference!" reported a former client through his breathing tube from his hospital bed (we hope you know what we mean by "former" client). Most reviews are are called in live, from a cellphone onsite in the form of: "AAAAAAAAAAAAAAA!!!!!!!!! (click)" Some of our staff's children have taken a Dinosaur home with them to the neighborhood bully's house or on the school bus the next morning, with grave, er, great consequences. You can choose from various Packages, all determined to bring maximum enjoyment and thrills to your next business meeting, convention, or party. *NOTE: Each Package requires all persons in attendance, that is any person or persons having access to the Dino Kill Zone, or those within 4 city blocks to provide dental records or agree to grant access to such records. We also require proof of renter's insurance, information regarding blood-type and next of kin written on 3x5 cards (free cards supplied by the C4CS for nominal fee). We also offer optional Summations Ceremony Package which briefly reflects on highlights of the life of the recently departed (aka: person having access to the Dino Kill Zone) while they were here on this Earth with us. These will be used at memorial services or funerals at a future date, usually about 7 to 10 days following the Dinosaur Rental date. PACKAGE 1.S It doesn't get much better than this. Only worse. Package 1S is "Mother"... our 43-foot Spinosaurus aegypticus, and by far the most active of our Dinosaurs. You and your guests will be astonished at how quick and FAST a creature this size can move. In other words, don't plan on your gathering lasting late into the evening. She is also our largest Dinosaur. That makes her great for any outdoor activity, and NOT so great for just about anywhere else. 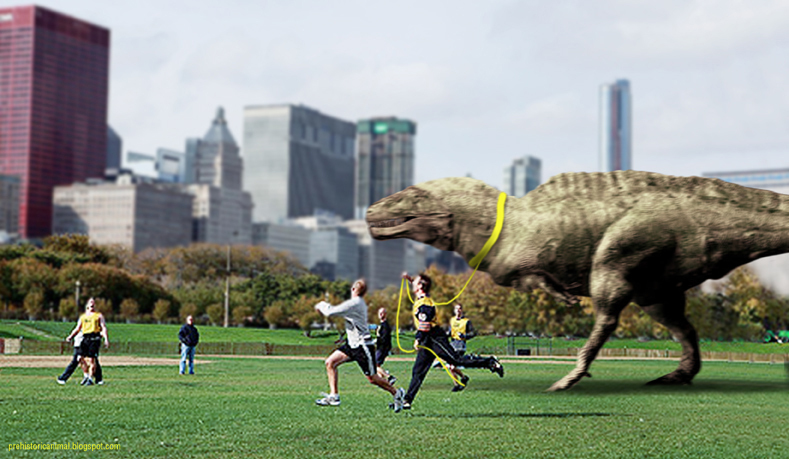 PACKAGE 1.T Gets you up close and personal with one of our crowd favorites, our 32-foot Tyrannosaurus rex. We suggest this Package for larger gatherings, such as convention halls, high school gymnasiums, city auditoriums, outdoor car shows, parades, backyard barbecues, or any outdoor activity where people have places to run away to. PACKAGE 2.T Ordering this Package is ONLY for industrial or military use. As the title implies, this Package involves two of our T. rex's appearing at the same venue. You think we have a tough time handling them here?? Just wait until they get to YOUR little suarez! PACKAGE 4UT brings the fashionable, popular Utahraptor ostrommaysorum. Recommended for outdoors or large indoor rooms (i.e: high school gymnasium, conference halls), don't be fooled by the smaller size. Our Utahraptors may stand "only" 5-feet tall at the shoulder and barely over 22-feet long, but they can dismember a cow in 11.7 seconds (cow not included). Package 4UT is limited to four animals due to numerous federal, state, and local ordinances... and the fact that none of our surviving staff have ever been able to deal successfully with five at a time. 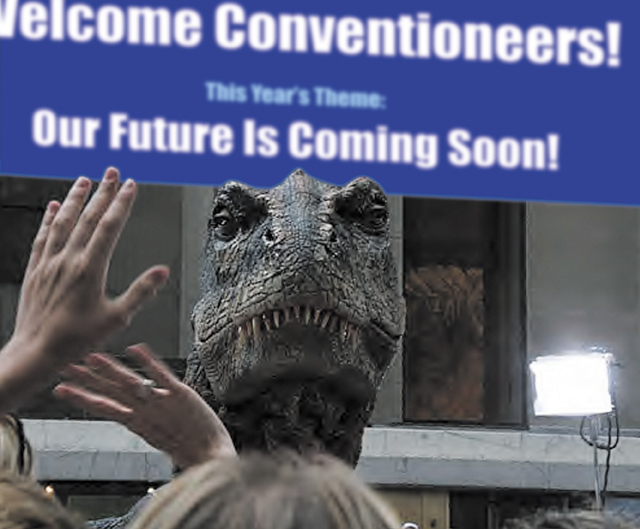 THE CONVENTION EVERYONE WILL BE DYING TO ATTEND! Our somewhat helpful and sometimes courteous staff will aid you with the decision making process when making your leasing choice. Call us today to reserve your rental Dinosaur, or to at least start the process. [It's long. It's tedious. It's about payola to certain government officials to look the other way. But the hard part is getting someone who wants to chaperone the event] Once you make that call, you're only a few steps away from being the lead story on your local, state, and possibly national evening news! *NOTE: Forms and contracts usually require 6-8 weeks, negotiations require 2-4 weeks, finger pointing- another 3 days or so. C4CS recommends transfer of funds into our Swiss bank account 72 hours before scheduled shipping. Dinosaur(s) arrive via truck shipment, with heavy, heavy, HEAVY, security, accompanied by eighteen C4CS staff members per ton of Dinosaur. We'll also require landing permits and subsequent room to bring in troop-carrying helicopters as needed, and enough parking area for troop transport trucks and small artillery vehicles. Net Price: If you have to ask, you can't afford it. 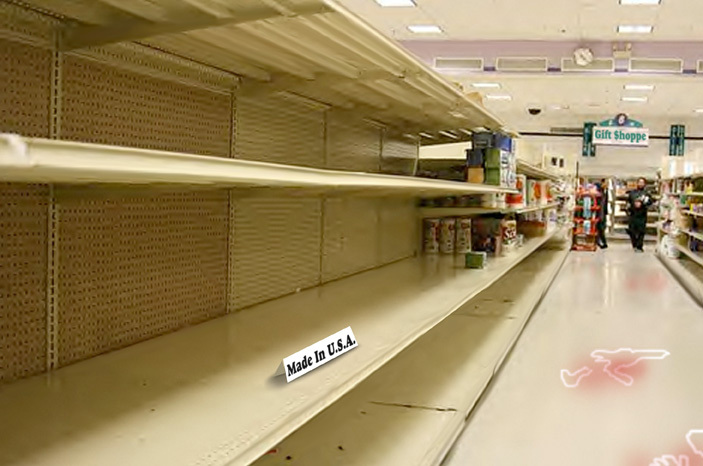 To Get More Information About Our Often Hazardous Products, Contact Us At CretaceouStudies@aol.com or CretaceouStudies@yahoo.com or CretaceouStudies@gmail.com TODAY!